Oh dear…the Bloody Bonza Bucketty Beetroot and Bean Burgers did not pass muster from the tough judges running the Inaugural Mangrove Country Fair Veggie Burger Taste Test. Head Taster Shrek saying “I really, really liked the flavour, quite a meaty consistency if I can use that word, and they held together pretty well.” Cheeky and Mrs Shrek however expressed their concern over the colour “I just don’t understand why any vegetarian would want a burger that looks so red – its like meat. Veggie burgers needs something green in them”. The killer however was the case of shall we say “bottom burps” that all the tasters were afflicted with afterwards. Personally I don’t get this….the 4B burgers have been made and eaten quite a few times in the VegHead household and we can’t report any subsequent windy-pant problem. 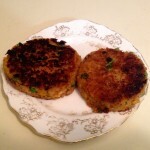 However we’ll settle for the judge’s final word in this and so we’re submitting another entrant: Sweet potato and rice burgers. Catering Portions – For those looking to use this recipe for catering size proportions, such as we did for the Mangrove Mountain Country Fair and the Gasfield Free Mountain Districts Declaration, base all ingredient amounts on using 1kg each of sweet potato, potato, carrot, (uncooked) rice, oats and frozen peas. You can expect about 50 generously sized burgers from such a mix – which each burger formed into a ball a little smaller than a tennis ball. When making such a large mixture I have found it to be best to mix the peas through the cooked rice, and mash everything else together separately. Refrigerate both mixes overnight in covered containers. Fork the rice/pea mix to separate then combine everything in a large container (or split the mixes into equal portions and do in batches if need be). There is no better way to evenly combine such a large quantity than to just do it with your hands. Boil the potato and sweet potato until soft, then drain and mash. Meanwhile, saute the onion over a medium heat in a generous amount of olive oil until transparent. Add the garlic and continue cooking for 30 seconds, then add the spices (not the herbs) and continue for another 30 seconds. Transfer to a large mixing bowl. Mash together the potatoes, sweet potatoes, herbs, onion/garlic/spice mix, oat flour, tamari. Once mixed add the cooked rice and the peas, and thoroughly mix by hand or with a spoon until completely combined. Cover and refrigerate the mix for at least 2 hours before forming patties. 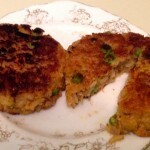 Cook patties in a cast iron pan until crisp on both sides. Patties can be frozen uncooked, once formed separated by squares of waxed paper. Uncooked mix should keep in the fridge for 3-4 days. Handy Tip: When forming veggie patties use an “egg ring” to get a good tight burger and also ensure even sizing. Form a ball of mix (experience will show how much you’ll need) and press tightly into the ring using palm or a flat spatula. Lift off the ring before cooking. You can either do this directly into the pan, or if preparing for later cooking form the patties in this manner onto the waxed paper. If a wider, thinner burger is desired to suit the size of the bun then squash the pattie as it cooks, just before turning it over to cook the other side. When The VegHead was a teenager he spent many an afternoon getting up to mischief with a friend who for the purposes of this blog we’ll call “770”. Living still with our parents, it was to their fridges that we turned when the fires of teenage hunger called for a shovel load of fuel, before we rushed out to do something constructive like change a differential. 770’s mum (bless her, lovely woman and still alive and kicking to this day) was…how shall we say this in a manner that accurately captures the respect and affection The VegHead has for this woman….well…..shall we say dotty sometimes. Delving into her fridge was an exercise in exploring the wild and wacky world of the leftovers that inhabited it. 770’s mum was never a fan of Tupperware either (and who could blame her), preferring instead to use old Flora Margarine containers. Finding the actual real tub of margarine generally involved finding three or four scientific experiments first; clicking off the lid from a container only to discover exactly what does grow on the half a dozen egg yolks separated off two weeks earlier when they weren’t need in that pavlova recipe. Indeed, opening the fridge in the first place generally gave access to a heady mixture of smells, reminiscent of the rich humus to be found on the floor of a rain forest. Vaguely comforting, and yet vaguely suggestive of extensive mould growth. It must also be said that this theme has not been entirely escaped in later life. SheWhoMustBeFed’s mother is rather fond of refridgerated biological experimentation. In her case however she tends to brew up a storm in jars and proper Tupperware containers, which at least has the redeeming feature of keeping the scent of decay more firmly sealed within. Left overs however are generally a good thing. They allow for good quick meals when you don’t have time to make something from scratch. Left overs are also a sign that you cooked enough to serve everyone generously, but that everyone has the sense to eat only sufficiently and not gluttonously. Just remember to eat the leftovers before they plan a revolution. Here’s what to do with a cup of leftover Thai Fried Rice. It’ll take less time than it’s taken you to read this post so far. A very nice and quick lunch. A blogger’s tasks are never done. Having spent a morning catching up on posts the laptop had been put down to suckle on the electricity and lunchtime had arrived. SheWhoMustBeFed has gone to pick up the Larger Loinfruit from her morning of Being Improved in a Dance and Drama Way. Cold out….so I made this soup ready for SheWhoMustBeFed’s return and then woke up the laptop to quickly write it up before they arrived. half of a large Jack Hawkin’s style tomato. Chopped. Oh…look….here they are arriving home now. This is from the archives…according to my notes this was invented 21st February 2000. A ‘Frente’ CD was playing during the cooking. Cook for 10 minutes over low heat. Stir occasionally, ensuring that tofu is coated evenly with liquid. Do not allow to boil. Cold, grey, dreary English days call for a hearty winter soup to take the chill out of the bones. SheWhoMustBeFed had been out doing errands and came home looking all blue and frigid around the edges, so I made this soup to thaw her out. The roasted vegetables add depth of flavour and texture. This recipe will feed two very hungry people, and it takes about half an hour from clicking on the oven to sitting down to eat. de-skin the garlic, place in a small covered baking container with olive oil and get that in the oven too. ** Note: I leave it to you to remove the onion, garlic and spuds from the oven at the right time. In my oven, the onion would take the longest, followed by the spuds. The garlic would be ready in about 15-20 minutes while the peppercorns would be (dry) roasted in 5 or 6 minutes. Once the garlic is roasted, puree it together with some of the soup and add to saucepan. At this time also add the chopped rosemary and thyme, and fish out the bay leaves. Once the spuds and onion are roasted… the outer skin of the rost onion will be chewy and needs to be removed. Stand the onion on one end and slice in half with a very sharp knife (a blunt knife will make a right mess of this as the onion should be very soft). Lay down the halves on their cut side. Using whatever implement is to hand, “pinch” off the outer layer and discard. Cut the roast onion into largish pieces. Add roast potato, onion, pepper, chopped dill and parsley to the soup.